Text from The Christian Poet, 1728, adp. 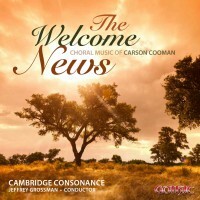 The Welcome News (2009) is a contemporary “fuging tune” in the tradition of colonial American composers such as William Billings, Jeremiah Ingalls, Supply Belcher, and many others. The work was commissioned by the Episcopal Cathedral Church of St. Paul and is dedicated to its music director, Ed Broms. The welcome news through every angel’s breast fresh raptures shall diffuse. The day is here, when all the world shall nevermore be wrapped in fear. No more shall we the once long fight renew. Worthy the day, when war shall cease and all shall raise the song of peace. Worthy the night, no longer rent by battle light and now serene. Take up the song of love and joy and bliss. Bells now shall ring to spread the news that swords shall rust from lack of use. On every hill may banners fly proclaiming peace unto the sky. Now raise your voice, and come: rejoice and sing! from The Christian Poet, 1728, adp.